A behind the scenes look at the JUICIEST crew in town. Creative Juice Group has been causing oohs and aahs at industry showcases and client events for years. The most recent showcase, held at the National Museum of American-Jewish History on January 31, was no different. The showcase presented the opportunity for guests to experience various services which could be offered by catering, event, photography, entertainment, and other companies for their upcoming events. After only working with the company for a few weeks, Kylie (a fellow intern) and I had the amazing opportunity to bring one of the numerous acts offered by Creative Juice Group to life. Along with Cedric, a long time performer for the company and a staring competition champ, we began getting ready for the event hours in advance. Preparing for an event involves hours of work, most extensively probably being the application of the makeup and body paint, although Kylie saved some time on her eyelashes since they are “great and the best part of her body”. But, the hours were all worth it when it was showtime! As Kylie and I would refer to our look- ‘white glittery snow princesses’ (we didn’t have the tiaras but we can pretend), we were dressed from head to toe in breathtaking white. 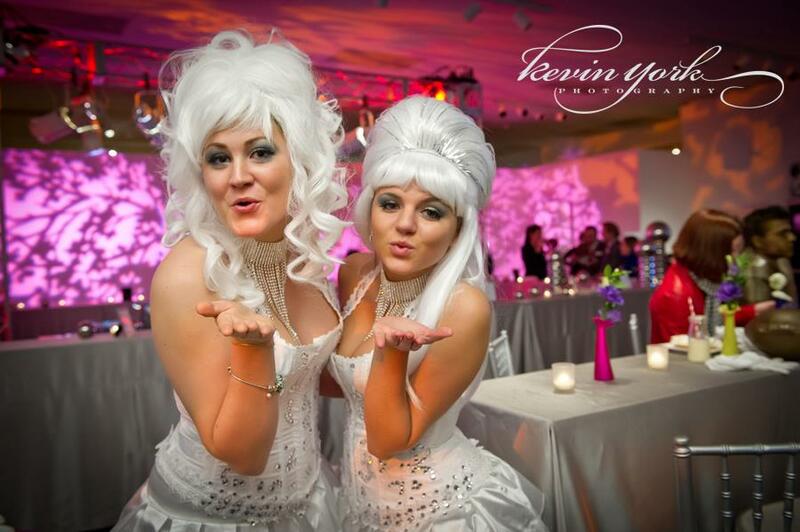 With our larger than life hair and glittery white and blue makeup, we greeted guests as they arrived and set the stage for the event. Upstairs, Cedric was placed as a Bronze Football Player- sprayed with bronze paint and standing completely still as the elevator opened and let guests out. However, as soon as they walked by, the statue came to life and spoke which shocked the guests- in a good way. The element of surprise is what really sets Creative Juice Group apart from other companies. Most guests were truly taken aback and pleasantly happy when they saw a fun element at the event, with performers dressed up and adding intrigue to the showcase. Numerous compliments were thrown at Kylie and me about how great we looked and how awesome our costumes were (which was a great business compliment as well as a personal confidence boost for us). The effect that Creative Juice Group services have on guests- putting automatic smiles on their faces- is amazing and doesn’t really resonate until you witness it first hand. Every vendor at the showcase did a fabulous job- including Kevin York Photography, Cinemacake, Feastivities, and Offshoots– and I am extremely proud to be given the opportunity to participate in this showcase with Creative Juice Group, where every creation is more interactive, more sparkly, and more over the top than the one before. This entry was posted on March 18, 2013 by creativejuicegroup.